Even though there are seemingly miraculous treatments for asthma symptoms, asthma is still a serious — even dangerous — disease that affects about 26 million Americans and causes nearly 2 million emergency room visits ever year. With proper asthma treatment, you can live well with this condition. Inadequate treatment of the disease limits the ability to exercise and be active. Poorly controlled asthma can lead to multiple visits to the emergency room and even hospital admission, which can affect your performance at home and work. During normal breathing, the bands of muscle that surround the airways are relaxed, and air moves freely. But in people with asthma, allergy-causing substances, colds and respiratory viruses, and environmental triggers make the bands of muscle surrounding the airways tighten, and air cannot move freely. Less air causes a person to feel short of breath, and the air moving out through the tightened airways causes a whistling sound known as wheezing. People with asthma have red and swollen bronchial tubes. This inflammation is thought to contribute greatly to the long-term damage that asthma can cause to the lungs. And, therefore, treating this inflammation is key to managing asthma in the long run. The airways of people with asthma are extremely sensitive. The airways tend to overreact and narrow due to even the slightest triggers such as pollen, animal dander, dust, or fumes. Asthma may occur at any age, although it’s more common in people under age 40. According to the Centers for Disease Control, in 2013, 18.9 million American adults, or 8.2% of the adult population, had asthma. People who have a family history of asthma have an increased risk of developing the disease. Allergies and asthma often occur together, along with eczema. Smoking with asthma, a dangerous combination, is still seen commonly. However, anyone can develop asthma at any time, and adult-onset asthma happens frequently. If you have symptoms of asthma, talk to your doctor. If you have adult-onset asthma, your doctor will instruct you in using the asthma inhalers and other asthma medications to prevent further breathing problems. Your doctor will guide you on which medications are for prevention and which medications are meant to “rescue” you if you experience difficulty breathing. Asthma is increasingly prevalent among children. Nearly one in 10 American children now has asthma, a sharp rise that still has scientists searching for a cause. As of 2013, an estimated 7.1 million children under age 18 (9.5%) have been diagnosed with the disease. The rate of childhood asthma has more than doubled since 1980, according to the CDC. Frequent coughing spells, which may occur during play, at nighttime, or while laughing. It’s important to know that coughing with asthma may be the only symptom present. Whistling sound when breathing in or out. This whistling sound is called wheezing. Seesaw motions in the chest from labored breathing. These motions are called retractions. 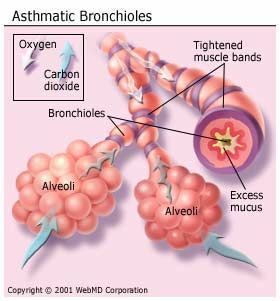 Prolonged asthma attacks that do not respond to treatment with bronchodilators are a medical emergency. Doctors call these severe attacks “status asthmaticus” and they require immediate emergency care. If you suspect that you have asthma, see your doctor. Your doctor may refer you to an asthma specialist, also known as a pulmonologist. He or she can examine you and run tests for asthma to determine if you have it. If an asthma diagnosis is made, there are many asthma treatments available to relieve your symptoms. And be sure your doctor has given you an asthma action plan. This plan should outline your treatment and medications to be used.